At the beginning of February, I received an announcement from the Illinois St. Andrew Society about an upcoming History Club program. This sounded interesting. The pedigree on the speaker was impressive. She had worked for the Victoria and Albert Museum in London and the costume department at the Metropolitan Museum of Art in New York. I contacted Pam and she was able to go. She'd also never been to the Scottish Home although she and her husband were members of the Illinois St. Andrew Society for a number of years. She suggested that although refreshments would be served, lunch was a good idea. So, Saturday morning we set off. 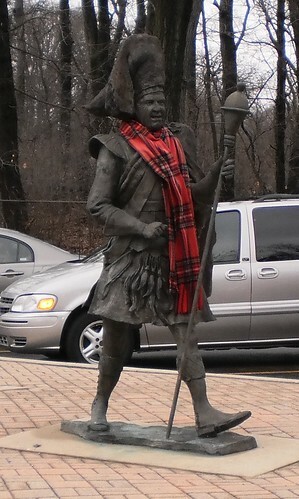 The Scottish Home is tucked behind some Chicago Forest Preserve property in North Riverside. The building is set back from the road so it is tranquil and quiet. There are woods all around. The road leading up to the home is about one and a half lanes of very pitted blacktop. If I could win the lottery, I'd surely consider giving them the money to repair it, maybe widen it another half a lane and set up an endowment to fund snow removal. I wondered just how bad it was in the blizzard. To the left is the statue that greets you as you arrive at the home. The program was very good. Ms. Goldthorpe has a passion for costume that translates well. She said she came away at age 14 from a trip to the Victoria and Albert Museum thinking, "I'm going to be a curator when I grow up." She feels costume directly connects you to the past. This item of clothing was worn by someone out into the daily life of that age. So much can be deciphered and learned from the clothing people wore. 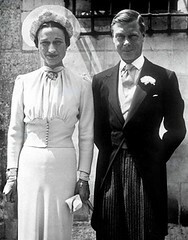 As an example, she showed us the famous photo of the Duke and Duchess of Windsor on their wedding day. Wallis Simpson donated her wedding gown and accessories to the Met. They have 3 gloves from the wedding day, 2 lefts and a right. Why 3? If you turn one of the left hand gloves over, you'll see the underside of the ring finger is open. Fashionable women of this age wore gloves. Mrs. Simpson had a glove made so she could slip on her wedding band without removing her gloves. Then, later, she could put on a full glove. Her talk was on Victorian fashion. It covered a 50 year period, from 1837-1877. This could be considered the height of Queen Victoria's reign and the height of the big hoop skirt fashion. She was working at the Met when she created this exhibit. She told us that curators will use professional window dressers, the people who create the displays in department store windows. Curators do the work to tell the story. Window dressers then bring that story to life. In her exhibit, the man they hired used mirrors to highlight the dresses. Viewers then got the full view of the pieces on exhibit, even when they were put up against a wall. 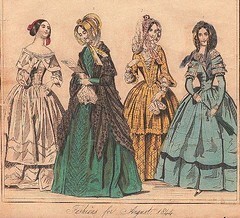 Fashion in the 1840's had gone from the huge puffy sleeves at the shoulder to puffs from the elbow down. Waists were being tucked in via the corset and the skirt size was increasing. She said one should never wear an actual costume. Our bodies are totally different in structure now. From age 8, women wore corsets. This changed their body structure. She said they had to start with a dress and build their mannequins to fit the dress. The run of the mill store mannequin did not work. By 1865, we have the silhouette we know from "Gone With the Wind". 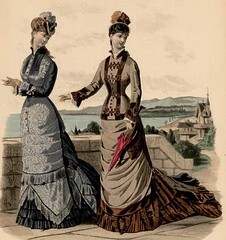 Women are still corseted, but the sleeves are straight while the skirt has reached huge volumes. 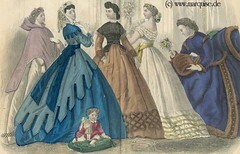 In the 1850's, to get the large size, women had to wear lots and lots and lots of petticoats. These were hot and heavy and would get wet walking about. In the 1860's, the cage crinoline was invented. It's essentially a cage made of flexible wire that a woman put on. It gave her the volume without the layers. Ms. Goldthorpe said it was incredibly light and freeing. Plus, being flexible, a woman could do most anything without the weight of all that fabric underneath. She said we tend to think of these hoop dresses as being only for the rich. While the exquisite fabrics were only for the rich, every woman wore a hoop. They have photos of notices in textile mills telling women they could not wear crinolines on the job. She had a photo of a couple of woman who were part of a "match book strike". They went on strike for better wages and working conditions against a manufacturer of match books. They were wearing hoops. Another interesting thing she told us was that fashion dictated no part of a woman's lower body was to be seen. Well, if you were out and about, the bottom of your dress would get very worn. As fabric was expensive, something had to be done to preserve the bottom hem. The "brush braid" was invented. A servant would spend hours sewing this 2 inch wide strip of heavy fabric with brushes attached to the bottom of the dress. About 3/4ths of an inch would show below the hem. This fabric would take the wear and tear of daily life while preserving the actual dress. This came in several colors. By the 1870's, fashion was changing again. The corset is still in use, but the voluminous skirts are gone, replaced by a slender skirt. The huge amount of fabric in the skirt itself has simply migrated, to the back. This is the era of the bustle and train. Fashion originated in Paris. Dress illustrations would be published in Paris and find their way to England within 6 months and on to the U.S. within a year. At the end of her talk, she touched briefly on 'mourning'. There were strict rules for mourning. Women had to wear black for 2 years after a death. Then they went into 'half-mourning', where part of the dress could be dark blue or gray, but the bulk still had to be black. Children could wear pastel blue and lavender. Men got off easy. They had to wear black for 2 years but could wear an armband and call that 'mourning' dress. If a widower remarried within that 2 year period, on the occasion of his wedding, he could remove the band, but it had to be replaced the next day. His new wife had to join him in mourning, meaning, the day after their wedding, she had to be seen in black. Ms. Goldthorpe told us the story of people being invited to stay with Queen Victoria at her country home. They were advised that mourning dress was to be brought along. Victoria was related to so many people that she could receive word of a death while on holiday. Guests were to immediately don the appropriate state of mourning clothes. It's no wonder period sketches show rich women traveling with 4 or 5 trunks of clothes. You had to be prepared for everything. It was a wonderful hour-long presentation. One of the best stories told was when Ms. Goldthorpe and her associates were interviewing prospective window dressers. They were anticipating the man they eventually hired. A gentleman appeared at the appropriate time. He was ushered into their conference room and seated at the end of the table. Each woman who was involved in the exhibit told a bit about themselves and their role. At the end of this roughly 10 minute discussion, they looked at the guy and said, "So, what do you think about this?" He looked at them and said, "It sounds great but I'm just the messenger with a package for X. Can I deliver it to him now?" After wiping the egg off their collective faces, the messenger was allowed to finish his task and the real designer was ushered into the conference room. I'm very tempted to buy the book from the exhibition, "From Queen to Empress. Victorian Dress 1837-1877."